No Heat. No Fuss. And No Hair For 4-6 Weeks!Stay hair-free for weeks long than shaving. Say goodbye to burning hot waxes, razor cuts, and tweezers. 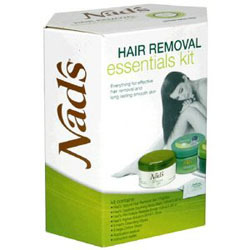 And say hello to Nad's - safe to use, 100% natural. You'll never want to use irritating, smelly depilatories or bleaches again. Because with Nad's you can finally have the soft, touchable, hair-free body you've always wanted! With your help we can reach more people and let them know about Nads Hair Removal whether this product works or not. I guess I have fine hair...but this crap was painful. Not to mention i was left with short broken hair. Hardly worth it. Watch where you use it! It was a bit painful on my legs... if I used aloe vera on them afterward it wasn't so bad... but DON'T use it on your underarms! I was bleeding and in a lot of pain! The good thing... the hair didn't come back for a long time. But - when it did grow back I couldn't bring myself to use the product again. I love Nads for my eyebrows but that is it. I tried it on a small patch of my legs and no way. However, way easier for eyebrows and they stay nice for about 3 weeks. So yes for the facial wand. No for everything else. This process is soooo painful! It was terrible. It also left a razor-like rash all over my legs. The only good thing was it took a long time for the hair to grow back. But it just wasn't worth torturing myself again! It wasn't as painful as waxing but it broke capillaries on the skin from my ankle to my knees. Back to shaving. You can not use this product on yourself. I was able to wax my sisters leg, but the pain was so great she did not let me do the other.